I have been wanting to make Old English Potted Cheese since I came across it on The Guardian. Potted Cheese is a cheese spread and it’s actually a bit like a recipe I have on my site already, Fromage Fort (translates as “Strong Cheese”) but I’m always intrigued by anything with the word “potted” (a spread) or “potage” (thick soup) or even “potager” (it’s a garden). Potted or Potage or Potager just sounds better, don’t they? I think of quaint thatched cottages with their wild tangles of flowers, and then my mind drifts to scones, clotted cream, and brambleberry jam. Not that I’ve ever had brambleberry jam but I know I’d love it. I do have a recipe for Potage – Cream of Spring Vegetable Soup, but I digress and Spring is many long months away. Months and months and months away. And here it is February, and I’m backing off on those daydreams of gentle breezes and wisps of clouds in blue skies, the air filled with the scent of flowers, the birds and the busy bees because I am thinking this Old English Potted Cheese is going to be perfect for Valentine’s Day. What we have here with this Old English Potted Cheese is a pretty amazing Cheese Spread that’s packed with flavor for days. It’s going to be great spread on crusty bread, crostini, crackers or just about anything you want to spread it on. It can be served as is or toasted till melty and crusty in the oven. There are a lot of variations of Old English Potted Cheese; I chose the traditional recipe (from Jane Grigson, a renowned English cookbook author and also consulted one of my fave blogs, British Food in America, so this isn’t exactly an original idea. If you’re a food nerd, British Food in America is a fun read with lots of hints and variations and recommendations. It’s a lot of info for a bit of cheese whirred up in the food processor! People are passionate about Potted Cheese for good reason, beyond that it’s been traced back to the 18th century! It’s just so freakin’ fantastic! So I already gave away the secret to making Old English Potted Cheese. Whir it in a food processor. Grate the cheese and then pulse into the smallest bits before you add the butter and the rest of the ingredients. Make sure the butter is at the right temperature. If your cat has been camped out on your kitchen floor register (because it got down to 36 below last week and she’s figured out how to stay warm) and you walk in to find your kitchen is frigid, pop your butter in the microwave for just seconds. The butter should bend but still hold its shape so it blends well, and not be too warm, either, or it might seem a bit oily in the final product. Today, I went absolutely classic; the only change I made was to use a Vermont white Cheddar and a little allspice instead of the mace; I don’t usually cook with mace so I don’t have it on hand, so I’m betting most people don’t. I’d def include the allspice, though – it’s like a little magical touch. There are so many ways to vary the recipe. Different cheeses (and potted cheese is often made with bits of this and that), different alcohols, and while some are suggested in the recipe, you could add just about anything you’d like. Wines, whiskey, bourbon, even beer as long as it will complement the cheese. Think about add-ins, like roasted garlic, caramelized onions or shallots. I even thought a smidge of horseradish or maybe a splash of hot sauce would be great in this and an herb or two can set it off. Maybe thyme, marjoram (there’s a touch of marjoram sprinkled on the cheese in my pics) or rosemary if you’re into it. Really, it’s hard to go wrong. And it has to be said because I’m an American: why not some bacon?! You’re probably going to want a good cheese for this recipe, and there are several kinds of English cheese listed in the recipe if that’s in your budget. I kind of splurged on a Vermont Cheddar and the flavor of the spread is incredible. It wasn’t cheap but it was worth every penny. It also came out to be a lot less than any old grocery store prepackaged carton of Kaukauna (and made more) or a purchased cheeseball. I’m justifying, I know. And when Kraig (my son) was by, raiding the fridge, I gave him a dire warning not to touch that cheese! He’d eat cheese by the block when he was a kid and still will! I picked my cheese up at Costco, and my final price for the cup and a half or so of my Old English Potted Cheese was around $5.50 so it’s not like this is an outrageous price for an appetizer. If the price is not an object go as fancy as you’d like and just so ya know, even a grocery store Cheddar (shop well, buy it on sale; it’s always on special so stock up) will be fantastic once it has a bit of Sherry or other alcohol of choice and the spices dumped in. If you want your Potted cheese to go further at a party, spread it on crostini or toast or crackers on trays ahead rather than putting it out for everyone to help themselves. Cheese should be finely grated; if not, add to food processor and pulse well. Add the butter and process well into a paste. Add alcohol of choice and the mustard powder, cayenne, and ground mace, along with the splash of Worcestershire, if using. Pulse to combine, scrape down and continue to process until smooth and well combined. If possible, refrigerate for at least 24 hours before eating, to allow the flavors to combine. Bring to room temperature before serving or it may be hard and crumbly. Delicious served spread on toasts or broiled on toast or with a good biscuit such as a Digestive or an oatcake. Add the walnuts to cheese, place in a ramekin and top with walnut halves. Form the cheese into small cakes and roll in walnuts, topping each small cake with a walnut half. I’ll be sharing Old English Potted Cheese at Fiesta Friday #262, co-hosted this week by Jhuls @ The Not So Creative Cook and Angie of Fiesta Friday. This entry was posted in Click here for Fabulous Food Posts and tagged Alcohol, Appetizer, cheddar, Cheese, English, Maderia, Nuts and Seeds, port, sherry, walnuts. Bookmark the permalink. That’s funny, but my dog gets glucosamine but I don’t think I’ve thought to try it for me…I’m going to try both hints. Especially the vinegar…much cheaper, lol!!! This used to be a regular part of our before dinner treats when I was a kid. But I think my mother purchased it at Cracker Barrel or some other cheese store. It’s just the think for my company this coming holiday weekend, thank you Mollie. And I hope you are fully recovered soon, so sorry about your accident. You still take lovely pictures. Thanks, Liz. It’s slowed me down a bit, but it’s improving….We thought it was such a treat when my Dad (my Mom frowned at such things) would buy some spread or another. We’d stand around like baby birds while he spread the crackers and doled it out to us, lol!!! Now, that looks to be a right proper potted cheese. I love your ceramic container. We make potted blue cheese at Christmas over this way and spread it on ginger snaps. I wonder why we just have it at Christmas, I’m going to break that tradition. Easter Swedish (I’m going to take liberties with your dishes name) potted cheese with ginger snaps. Mollie, truly get some Anna’s gingersnaps and spread some of that potted cheese on it. I bet you’ll be hooked. Ron, that combo of bleu cheese and gingersnaps has got to be either crazy or crazy good or both!! I’m going to take a leap of faith and try it – two things I love and they’re both strong flavors, and I can almost taste it in my mind! Hope you start feeling better soon, my culinary friend. The cheese also looks delicious! Hang in there, Mollie. Hanging…by a thread but I’m not letting go – with my good hand anyway lol! Thanks Vanessa!! Mollie, I really hope you will fully recover very soon. I haven’t heard of this cheese, but I love cheese so I am sure I’d enjoy this one. 😀 Thank you for sharing at Fiesta Friday party! I never heard of this cheese. It looks and sounds awesome! I also like the name. Yes it does!! Not just an ordinary cheese! 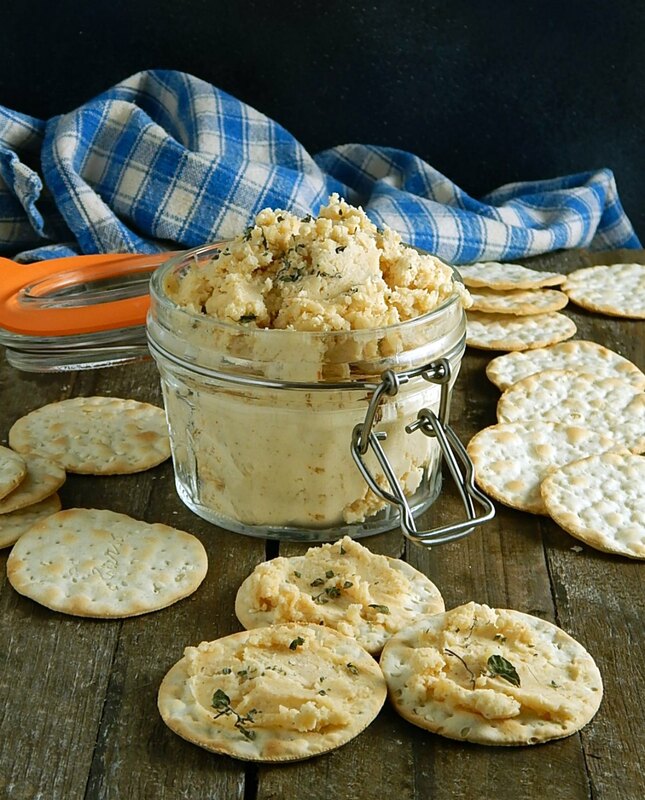 An amazing twist on sitting down with a plate of cheese and crackers with your potted cheese. I’m rather liking not cooking too much, lol!! Of course with no kids at home I don’t have to worry as much about nutrition, but even when they were home we’d have what we called hors d’oeuvre night a couple of times a month. Health/nutrition is something I’ve fallen down on for some time … I used to at least make some attempt at a protein, starch, veg/fruit combination on my plate. I gotta say now that I’m not doing more big meals I’m often opening up the fridge with nothing to eat and then eating random stuff. I gotta get better myself and do more food prep…when I’m hungry, it’s too late!! I agree about the eating random stuff. My biggest weakness is junk food esp chips. I sometimes buy a bag for snacking it rarely lasts past the first day I bring it home. Might need to give this a try, though it is going to be hard to tear me from my southern rooted pimento cheese. I like potted stuff too! I made potted salmon recently. This reminds me of a recipe of jacques pepin… his father called it fromage fort. It was a mixture of leftover cheeses. His father would add a little cognac and then let it age in the cellar. I do neither of those. The blend of cheeses is always fun. I cut off the rinds first, if the food processor can’t handle them, but just blitz away. Oh, I’ve seasoned the cheese and added garlic. Anyway, I like the cheddar mixture, but in case you’d never mixed up various cheeses, if works really well, too! You can add some cream cheese if necessary.. I have done a Fromage Fort, and I’ve never done potted Salmon but it must be a lot or maybe even just a variation of Rillettes? I’m always trying to stay away from the cream cheese, but I will toss some in sometime, maybe, lol! !